Fire danger today, according to National Weather Service – Welcome to Wyandotte Daily! Despite some areas receiving rain late Tuesday, dry conditions and dry fuels persist for others, according to the National Weather Service. This, combined with lowered relative humidity values and breezy winds during the next couple of days, will continue to create heightened fire weather conditions, the weather service said. Residents are advised to avoid outdoor burning. No other hazardous weather is expected for the next several days, the weather service added. Today’s forecast will be sunny with a high near 51, the weather service said. A west northwest wind of 13 to 16 mph will gust as high as 24 mph. Tonight, expect mostly clear skies with a low of 28, according to the weather service. A northwest wind of 5 to 10 mph will become light and variable. 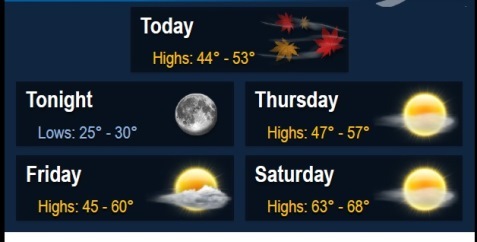 Thursday, it will be sunny with a high of 54, according to the weather service. A southwest wind of 7 to 16 mph will become northwest in the afternoon, and winds may gust as high as 23 mph. Thursday night, it will be mostly clear, with a low of 28, the weather service said. A northwest wind of 5 to 9 mph will become light and variable. Friday, it will be mostly sunny with a high near 57, according to the weather service. A south wind of 6 to 15 mph will gust as high as 22 mph. Friday night, the low will be around 41 with mostly clear skies, the weather service said. Saturday, expect a high of 66, according to the weather service. It will be breezy.